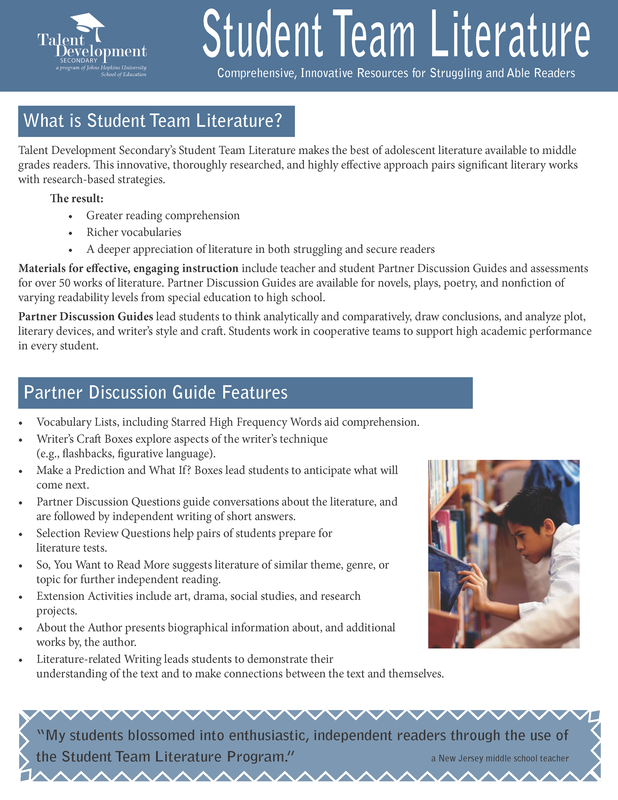 Student Team Literature is an innovative, thoroughly researched, and highly effective approach which pairs significant literary works with research-based instructional strategies. 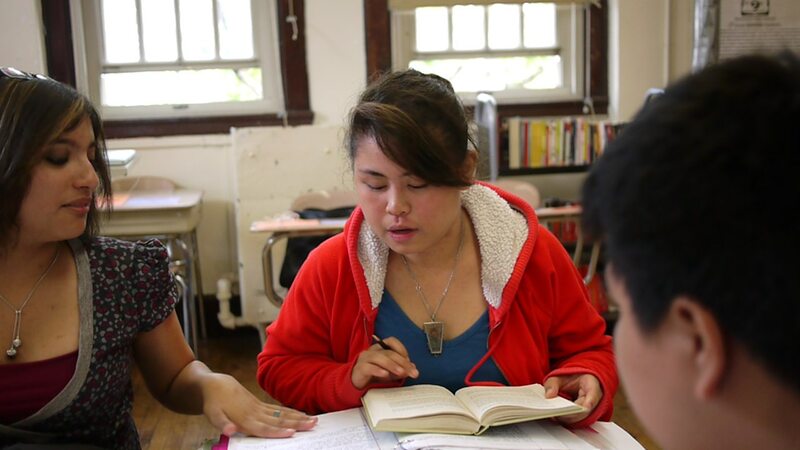 Our approach makes the best of adolescent literature available to middle grades readers. 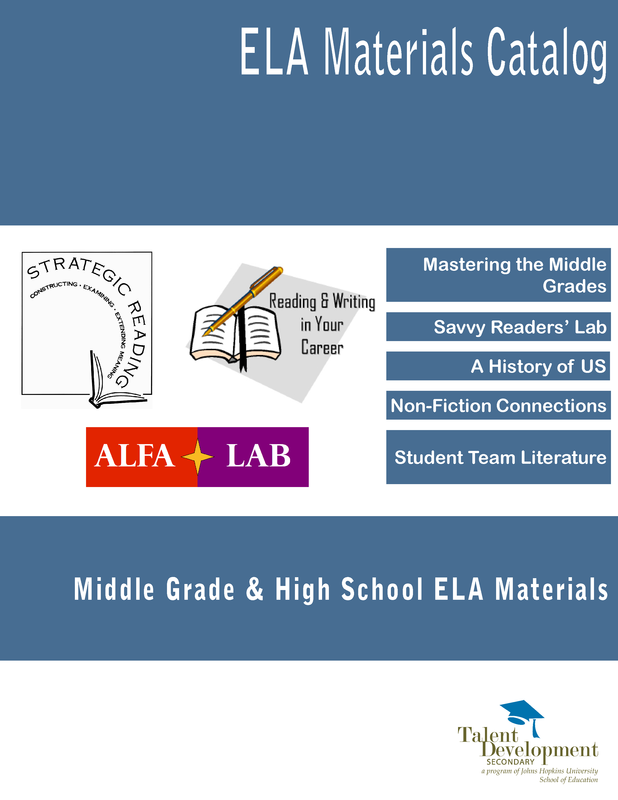 Materials for effective, engaging instruction include teacher and student Discussion Guides and assessments for over 70 works of literature. Discussion Guides are available for novels, short stories, poetry, and nonfiction of varying readability levels from special education to high school. Students work in cooperative teams to support high academic performance in every student. Vocabulary Lists, including Starred High Frequency Words aid comprehension. Writer’s Craft Boxes explore aspects of the writer’s technique (e.g., flashbacks, figurative language). Make a Prediction and What If? Boxes lead students to anticipate what will come next. Partner Discussion Questions guide conversations about the literature, and are followed by independent writing of short answers. Selection Review Questions help pairs of students prepare for literature tests. So, You Want to Read More suggests literature of similar theme, genre, or topic for further independent reading. Extension Activities include art, drama, social studies, and research projects. About the Author presents biographical information about, and additional works by, the author. 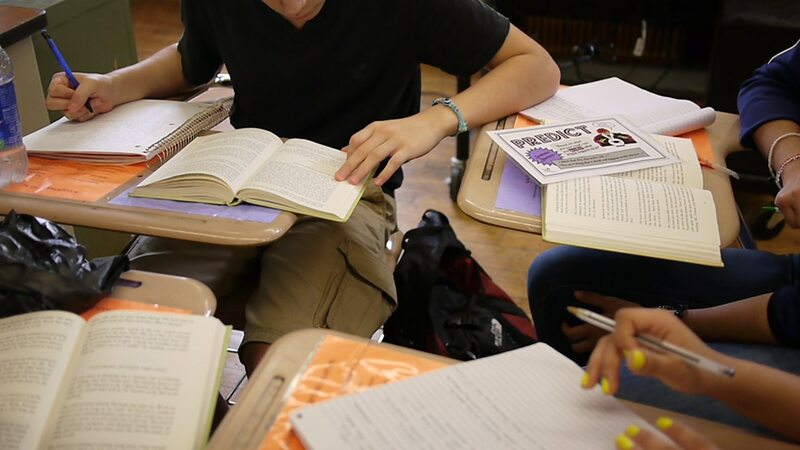 Literature-related Writing leads students to demonstrate their understanding of the text and to make connections between the text and themselves. 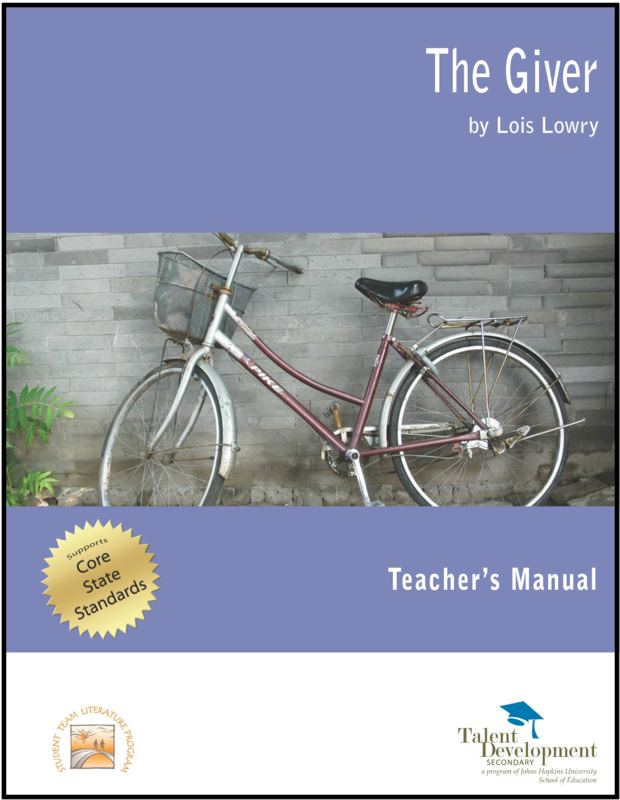 Teacher Discussion Guides include a summary of the literature, background material, questions to help students establish a purpose for reading, answers to guided discussion questions and teacher read-aloud suggestions for mini-lessons on selected literary elements and devices. The cycle of classroom activities includes direct instruction, team practice with discussion, and individual assessment.  Teaching resources are available for over 70 titles. Vocabulary and Literature Tests assess students’ use of new vocabulary, grasp of literary elements and devices, and comprehension. They require students to compose written responses to questions. Standardize Reading Practice Tests that mirror the format of leading standardized assessments are available for many trade books. These tests allow students to practice taking standardized tests within the context of the literature they are reading. SRPT’s provide periodic assessment of students’ progress in reading comprehension and reading vocabulary resulting from implementation of Student Team Literature. 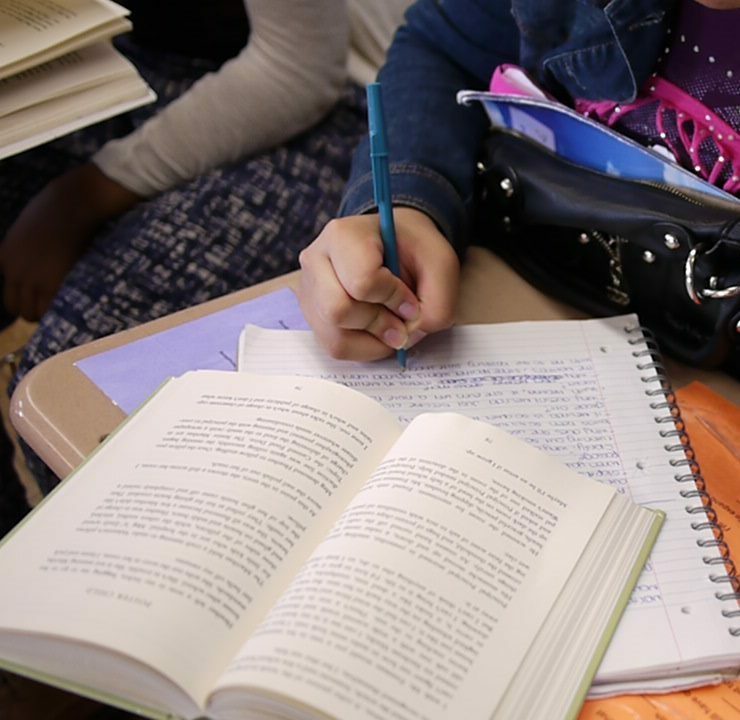 They allow students to practice taking standardized tests within the context of the pieces of literature they are reading, without interrupting instruction or “teaching to” a particular test. The tests include reproducible student test pages and teacher’s answer pages in one handy bound volume. They also supply teacher information including test administration tips, a breakdown of vocabulary and reading comprehension questions, and a handy fill-in chart for analysis of student skills mastery at a class-wide level. We welcome you to review the Student Team Literature discussion guide and SRPT samples. Each sample contains one sample lesson. 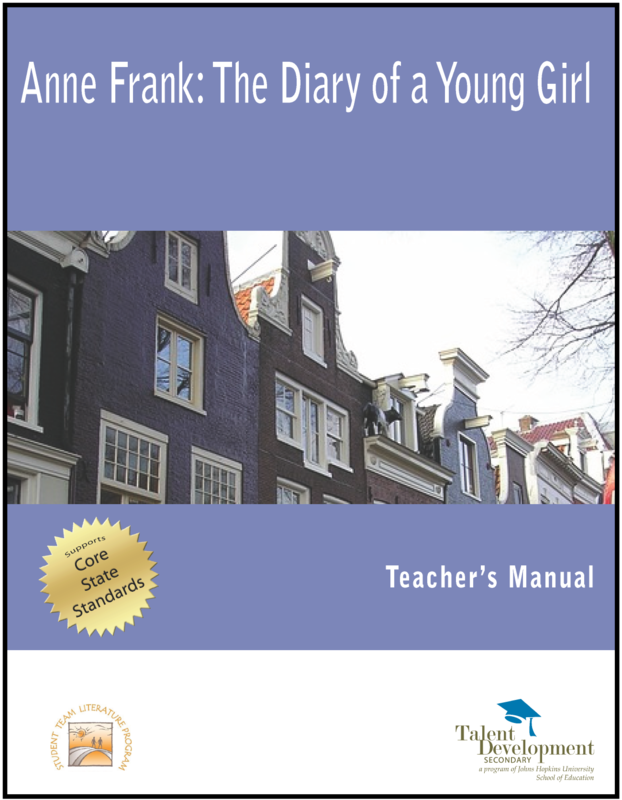 Anne Frank: The Diary of a Young Girl the classic diary of a thirteen-year-old Jewish girl hiding from the Nazis in a secret attic apartment in Amsterdam. The Giver In a futuristic community where there are no imperfectons, no pain, and no fear, there are also no choices; every member is assigned a role by the ruling Committee of Elders. This academically challenging instructional program, accompanied by ongoing and intensive professional development and mentoring of teachers, dramatically improves student performance at all grade levels in reading, writing, and language arts. 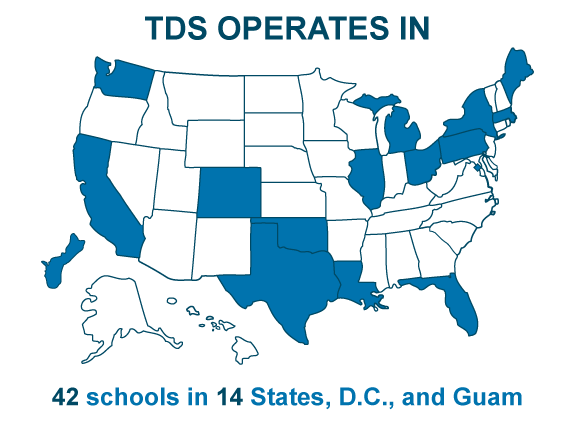 Please contact us to discuss how to customize our training to meet the needs of your school.